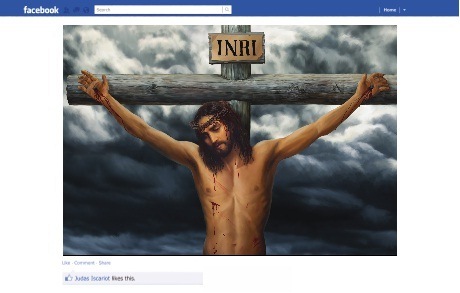 St Matthew-in-the-City’s Easter billboard appears to be a traditional image of the crucifixion but upon closer inspection it is a shared image on Facebook with only one like and it is by Judas Iscariot. In commenting on the billboard, Vicar Glynn Cardy observed contrary to traditional understanding, “Jesus did not die for our sins. He died because he peeved a bunch of powerful people off. He lived and preached a message of radical inclusion that threatened the status quo. The authorities killed him for it. “When there is a tragic death there is often a strong desire to apportion blame – the death of Jesus being a case in point. His early followers blamed each other and themselves. “The early Church blamed ‘the Jews’, overlooking the fact that it was a Roman execution. “Judas Iscariot, one of the disciples, has in particular been blamed and vilified for centuries. “The ‘dying for sins’ business was a spin the Church applied at a later date. It was part of a larger spin about him having to die, being God’s plan and all, in order to save us from our sins. We were to blame. “This billboard uses humour to laugh at and critique our ongoing desire to apportion blame. “The message of Easter is that blame, guilt, and regret will not lead to a happy, contented life. Blaming ourselves or others is not the way forward.